We Pens are a prolific lot, we are all working writers, whether we have books on the bookstore shelves or are not yet published. With the advent of a new era in publishing, some of us are making the switch from traditional paper publishing to self-publishing. It’s not a choice for everyone. And believe me, I want to be traditionally published as much as the next Pen!! But after a round of rejections from traditional publishers, I decided to self-publish my Black Cipher Files series which straddles the line between romance and thriller. The first book, BLOWBACK, released today!! Doesn't this cover ROCK? Madeira at Xuni.com is amazing!! Most of my novels begin with a ‘What If?’ question. What if espionage agents were being kidnapped and injected with an unknown drug? Why? What are the long term implications for the espionage community? And who would investigate the kidnappings? While I started playing around with the ‘what if?’ ideas, I was also reading a fascinating book on the National Security Agency, about both its past and present history. From that research, a fictitious branch of the NSA was born. I also postulated reasons for why certain committee documents from World War II are still classified. And my heroine Jamie Hunt came into existence. She is a very hard, very intense, very closed off woman. She doesn’t allow herself any emotional contact. Honestly, when writing her story my heart broke, because at our core we all need love. And she has a dearth of affection in her life. Jamie’s parents and brother were killed in a horrific car bomb attack when she was just fifteen years old and to protect her sister, she agrees to let her sister believe she died too. Fast forward thirteen years later, Jamie is in trouble, her sister is in trouble, and Jamie has nowhere to turn. Enter the hero, Lucas Goodman, who understands Jamie because he used to be just like her. He is determined to drag her into a relationship whether she wants to or not. The biggest compliment a writer can get is that a reader keeps their book on a shelf and periodically re-reads it. I love reading thrillers. What I’ve discovered about myself, found after years of reading, is that the plot can be fun and convoluted and intense, but I won’t re-read a book unless the character and romance is emotional and memorable. The details of the plot are just a framework for the relationship. Blowback has plenty of action, classified espionage secrets, and some fascinating science but Jamie’s growth as she finally allows herself to accept love is the reason I was drawn to writing this story. ps. And no I did NOT plan to release today, as a matter of fact, couldn’t believe it when the topic appeared in my inbox. Serendipity at its finest. pps. 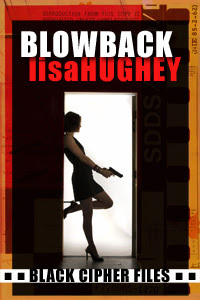 Blowback is available on Amazon http://www.amazon.com/Blowback-Cipher-Files-Romantic-Thrillers-ebook/dp/B005D76F4U/ref=pd_rhf_p_img_1 And BN.com http://search.barnesandnoble.com/Blowback/Lisa-Hughey/e/2940012752567 right now. It will be coming to Smashwords in the next week or so. ha! in a frantic race to the comments, i got here first. YAYYYYY! CONGRATS TO BOTH YOU GUYS ON SUCH AWESOME "BABIES" TODAY! I was here at 12:14, so Martha beat me. I'll be honest. Then, by cleverly sleeping late, I let the rest of you alert Lisa to the problem. HA! Congratulations Lisa! This looks great! Can't wait to read it! Yay! Congrats and can't wait to read your work!!! Go, Lisa!!!! !